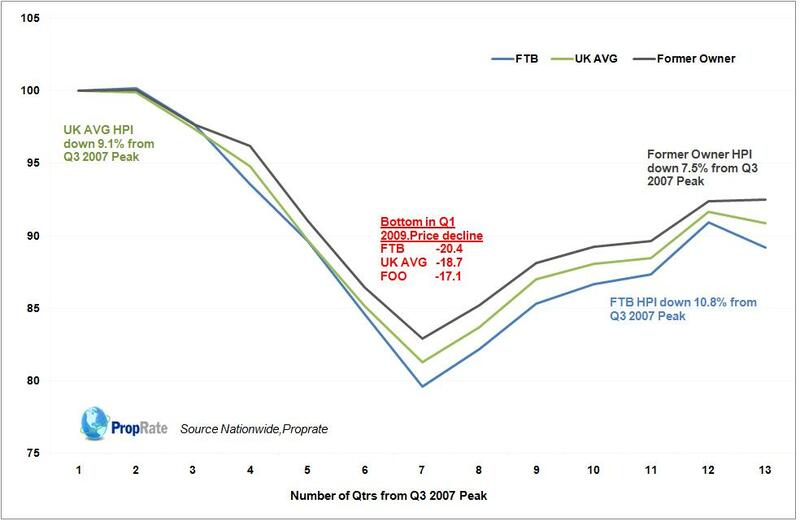 With the drying up of the mortgage market and asking for higher deposits, it is the ftb who has been hit hardest by this. Also the boom has been slightly bigger in ftb in the first place. While interest rates are low and house prices remain high, the foo are the ones with the high equity needed by the banks for the best deals. Hus a classic case of the ladder being pulled up behind them. They are balancing on the tip of low interest rates and still pretending to each other that hus all right as very few have fallen off, even if they can only move between themselves which is why very few people are moving and chains are falling apart. It is interesting to see that the ftb line is falling faster again. Looking at the halifax data the last few months have shown that what has held up well is the price of new houses. They no longer publish these figures, but the existing houses figures do not show any where near the rises of the nsa figures, therefore we deduce that it is the price of new houses that is keeping the overall price up. Ftb has not taken part in the mini boom of recent months in the halifax data either. The ftb data is important for the health of the housing market. For now the standoff continues. I totally agree. Low interests are supporting FOOs, but not much help for FTBs. We are in for a long period of falling house prices, unless there is a return to high LTV mortgages. Without FTBs the market is going to be stagnant or declining.